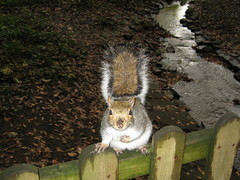 We recently went to Heaton Park to see Autumn properly, and took a few nuts for the squirrels. It’s only polite. There was a fascinating variety of fungi in the park. I’m tempted to become a mushroom-spotter next year and start taking mushroom photos as a hobby. I’m going to run out of Space Invaders soon in any case.